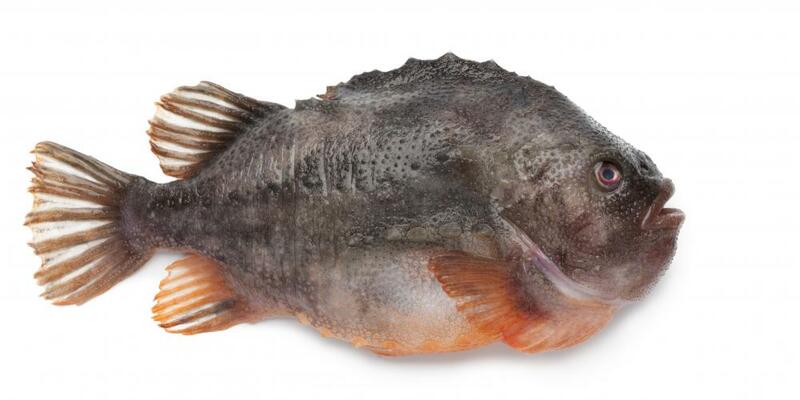 Lumpfish, like Atlantic cod, is a type of fish typically found in the North Atlantic Ocean. An Atlantic cod is a large marine fish found in the North Atlantic ocean. The scientific name for this species is Gadus morhua. It is a predatory, carnivorous fish. Traditionally, the Atlantic cod is one of the most popular white fish in the world and has been hunted by humans as an important food source for many years. Currently listed by the International Union for Conservation of Nature (IUCN) as vulnerable, this species has been overfished to dangerously low numbers. Reaching over 4.5 feet (1.4 meters) in length, this species can weigh up to 77 pounds (35 kilograms). The Atlantic cod has a life expectancy of over 20 years. This species eats a wide variety of shellfish, invertebrates, and other fish, while juveniles eat much smaller fish, invertebrates, and plankton. They are gray to olive green and are favored for their flaky white meat when cooked. Very popular as food, the Atlantic cod has been heavily overfished for many years to the point where the species is under serious threat and its continued survival is in doubt. In some localized areas, the population of wild Atlantic cod has decreased by approximately 96%. This is mainly due to irresponsible fishing practices. Conservation projects are now in place in most areas and are strictly enforced. The total weight of cod caught in each area has been limited; once this quota has been reached, no more can be legally caught until the following year. In some areas, the size of the cod allowed to be caught and killed is also limited, thus prohibiting the killing of the larger fish. Catching large numbers of bigger, older fish is no longer acceptable. This practice is considered to be one of the main causes of the huge population decrease. A large female can lay up to nine million eggs in a single breeding season, whereas a younger, smaller female often lays only two million eggs during the same period. Harvesting the biggest fish causes the number of eggs laid each year to decrease, meaning that the species is unable to produce enough young to make up for the numbers removed from the water. Atlantic cod do not reach sexual maturity until four years of age and then only produce small numbers of eggs until they grow very large. A female continues to lay eggs throughout her life, even into old age. It therefore makes more sense to catch smaller specimens to enable to the older, larger fish to lay millions more eggs, giving the species a chance to increase its numbers. What is a Blue Whiting? Atlantic cod, while severely over-fished, suffer equally or more from the collapse of their ocean pastures. These pastures and the plankton that sustain them have been in decline for decades, in lock step with the collapse of cod populations. The carrying capacity of pastures whether on land or at sea has always been the primary controlling factor with respect to the 'livestock' that those pastures support. Ocean pastures are turning into plankton deserts as high and rising CO2 in the world's air grows more grass on land. More grass growing means less dust blowing. Dust for the ocean pastures is analogous to rain for pastures on land. Without either the respective pastures loss carrying capacity. giving back the vital mineral dust, we are allowing those pastures to return to health and abundance. This has now been proven in the NE Pacific where in 2012, a vital large ocean salmon pasture was restored. Today, immediately following this work, the Pacific salmon have returned in the largest numbers in all of history. The same restoration of Atlantic ocean fish pastures can be accomplished to being back the fish, cod, salmon, and tuna to historic abundance in the Atlantic.